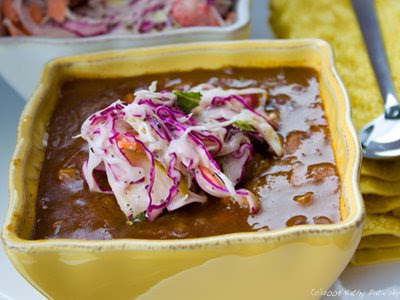 Chili and Cole Slaw: Easy. Vegan. Comfort Food. Amy's. It's one of those days when you want to eat healthy, but don't have much time. And take-out or fast food isn't going to cut it. 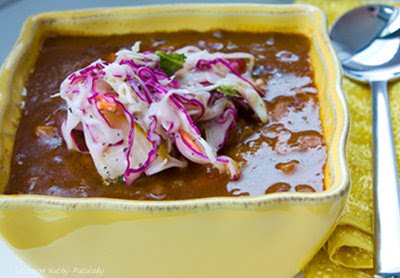 Well here is one super easy southern-style combo: chili and cole slaw. 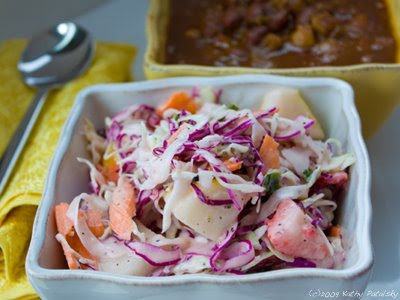 And if you've made the slaw the day before, this is a 2 minute meal. Cool Crunch. Steamy Bite. 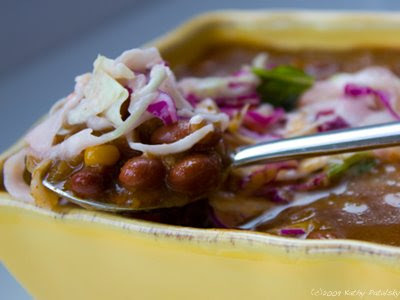 Nothing beats the flavor combo of cool crunchy tangy-sweet cole slaw paired with a steaming hot bowl of smoky-spicy chili. Add a side of honey-butter cornbread and experience southern hospitality. Amy is in the Kitchen! I love the Amy's Kitchen brand. And Amy's Organic Vegan Chili is perfect for this quick meal. Because unless you have super powers, there is no way you are going to whip-up steaming hot homestyle chili in under two minutes. 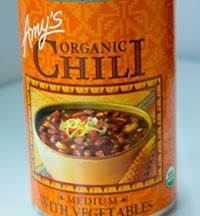 A full review of Amy's Chili after the jump. *2 servings per container, depending how hungry your are. Pour Chili into bowl. Cover with venting. Microwave on high for 1.5-2 minutes. Plate and top with fresh black pepper. If you have some honey-butter vegan cornbread on hand, that's great too! Enjoy...and get back to your busy day with a happy warm tummy. Shelf Appeal: Bright orange can. Yummy photo on front-actually represents what product looks like inside. San Antonio Texas flair. Ingredients label (vegan), no guess work. Thank you Amy. Taste Test: Chunky firm beans, savory smoky flavor with a hint of spiciness. Veggies are satisfying. Heats through very well. Flavor doesn't taste like it came from a can. Bits of tofu (protein) are so satisfying. Such a warm big bite. Label Check: per serving (1/2 can) there is a nice serving of 8 grams fiber, only .5g sat fat,6 g fat total, 6 g protein, 190 calories. 70% RDA Vitamin A and 10% RDA iron. Sodium is a bit high at 590mg. But if that concerns you, choose the lower sodium versions of Amy's products. Price Check: Around $3. The price is right for all this flavor. 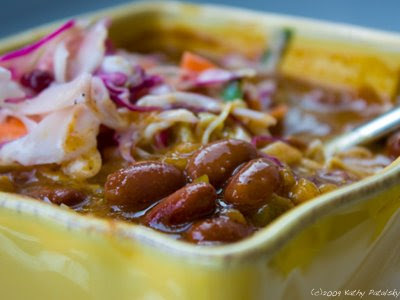 Last Word: Vegan comfort food to have on hand. Stock-up for less busy-day menu stress.